Last week I decided to try out the vintage blue sink we bought while in Pittsburgh. Our original sink top had been broken (you can see it in that photo I linked) for so long. A painting actually fell and broke it and we kept putting off replacing it thinking we would find a cool sink. Anyhow I went to the hardware store to see what I could find in the way of bathroom vanity cabinets. I bought the smallest one that had even though it came with a sink, and in the end the blue sink didn’t work out, but that’s ok. We will find another project for it. I wish I had taken some before pics of the bathroom, but this is the small bathroom on the first floor and there are no windows. It was a light mint green, and the old bathroom vanity was pretty large, brown with a plain white (broken) sink. First I removed the old sink and vanity thanks to youtube videos this was super easy! Then I actually painted all the walls a color called “blackberry jam”. It ended up really a bad color for this room. Floor to ceiling paint that was a plum colored (but looked maroon in the bathroom light) wasn’t flattering. I decided to leave it overnight and think about it. By the next day I still hated it, and figured if I was going to take all the time to re-do the bathroom I needed to love it. 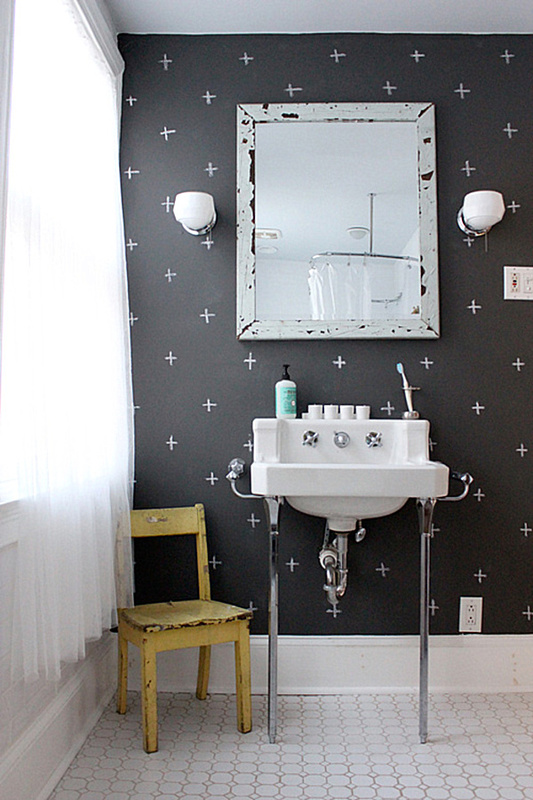 I had the idea to paint it with chalk board paint, and add a crisp white bead board and trim around the lower half of the bathroom to keep it from being too dark. While it was quite a bit of work over 4 days or so, I am so happy with how it turned out. You can see our friends have been having some fun with the chalk, and I love the idea of decorating it with some pumpkins come Sept. 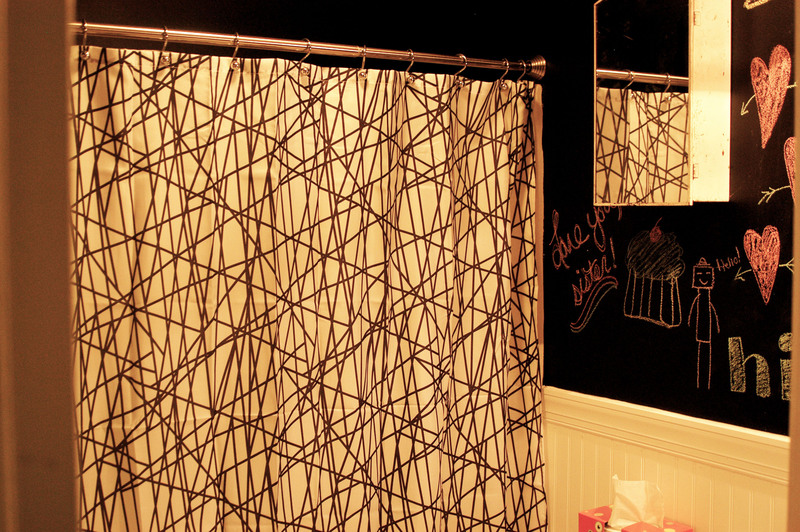 I also love the idea of using chalk board paint to create a simple design that looks like wallpaper. 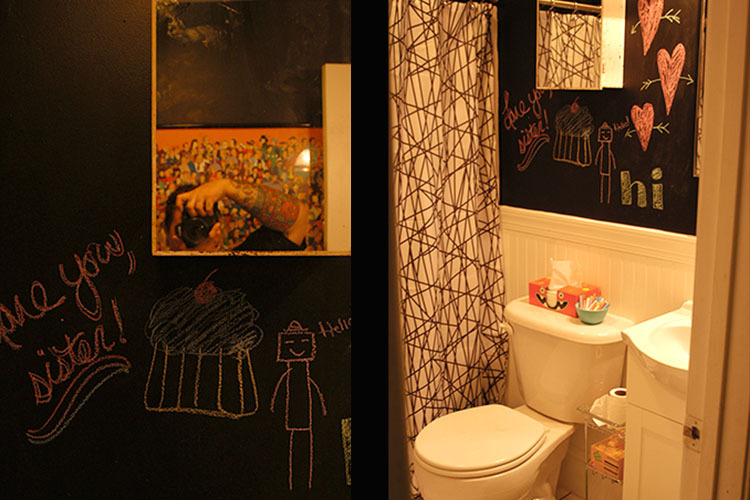 You can see our bathroom here before all the chalk drawings. Tagged DIY, home, makeover. Bookmark the permalink. You guys did a great job, looks great. 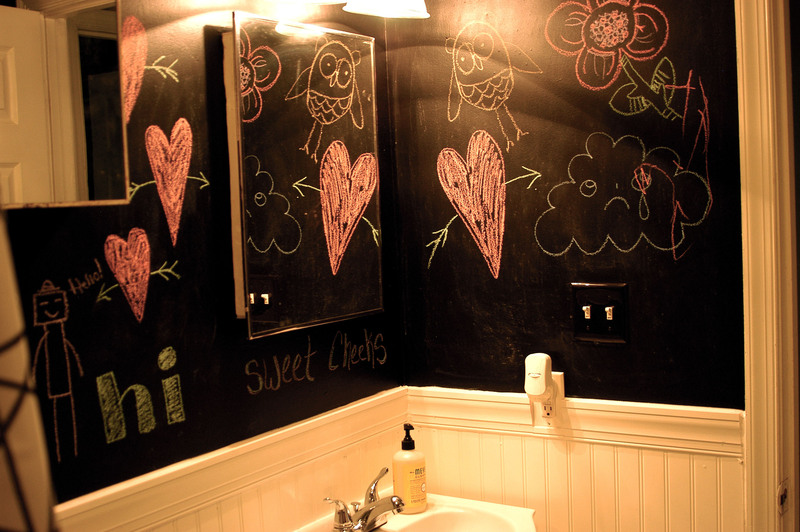 I LOVE the chalkboard paint idea, that is so cool!!! I love that! 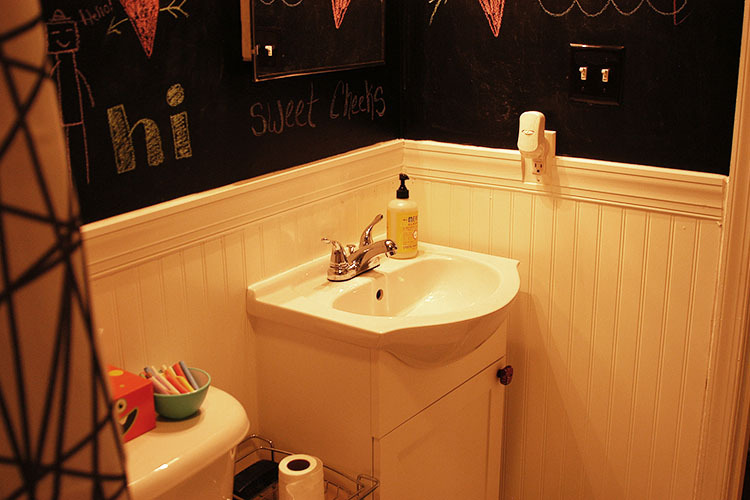 I’m thinking seriously about adding some chalkboard paint somewhere in my house, I’m thinking the kitchen since it’s the last room in the house to be redone. What brand did you use and where did you get it, and how many coats did you do? Good job. Too bad about the blue sink though, It was totally cool. Annette, we got ours at Lowes, it was the only brand they had there and quart size, but it worked well for the small wallspace. I used two coats and just have a tiny bit left incase I need a touch up. It was the Valspar brand. thanks Debbie, the chalkboard paint is lots of fun!